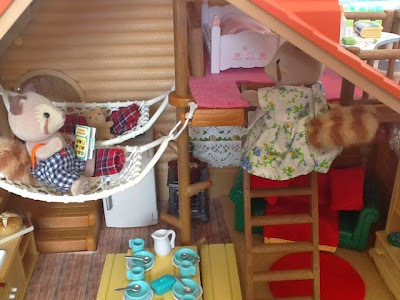 Sugarbush Valley: An ideal life: Happiness is... home, family, friends and surprises! Happiness is... home, family, friends and surprises! 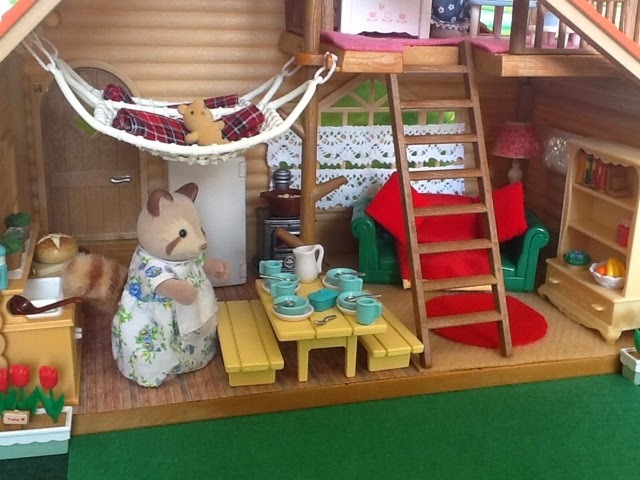 Mae Mulberry had a quick look around her cosy log cabin and felt very satisfied. 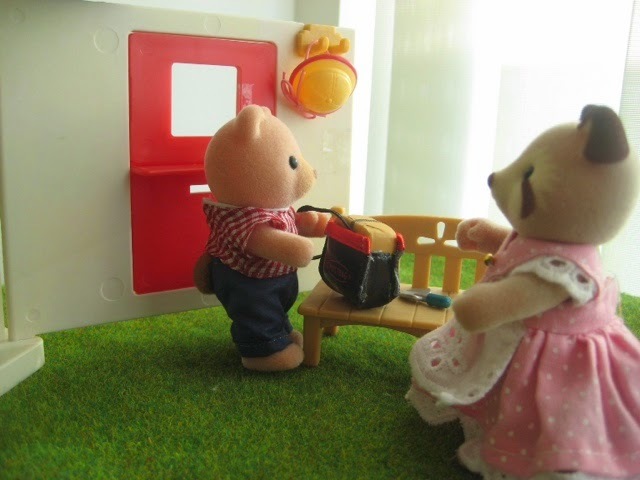 She and Elmar have been saving up for a while now to redecorate their home, and she has just finished putting the final things into place. Most of the furniture remained, as they couldn't afford to buy everything new. Like the small wood-burning stove, which Mae loves as it doubles as a fireplace. They did however replace the fridge as the old one stopped keeping things fresh a long time ago. The other new piece of furniture was the beautiful bookcase that was a wedding anniversary gift from Elmar. 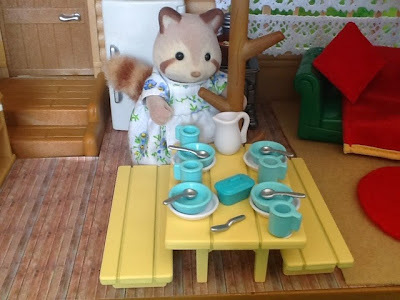 It was designed and made by Aaron Cottontail and Mae absolutely adored it. It was ideal for books and displaying knickknacks, but the handy drawer was ideal for stowing clothes and blankets. Mae also treated herself with a new crockery set. The ones she has been using was mismatched, cracked and chipped. The biggest and most expensive addition was the small attic room that was converted into a nursery for Pumpkin. 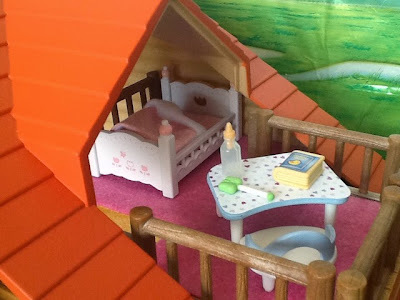 At first Mae was worried that her other two children might have an issue with the fact that their little sister gets her own room, but she has clearly underestimated their unselfishness. Ike assured her that he will never give up his hammock for a room, especially not as small as Pumpkin's. 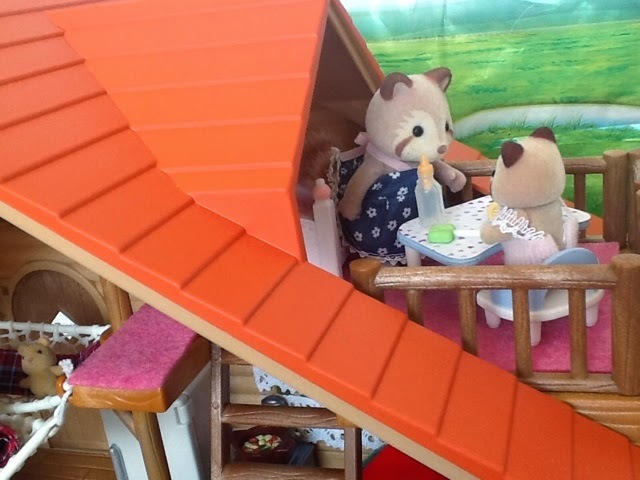 Candy made it clear to her mother that if she needs private time and personal space she will go into the forest or to her friend, Freya's house, and doesn't mind at all that her cute baby sister has her own room. Candy afterall spends just as much time there, playing with her sister. Outside the house Elmar also made changes. 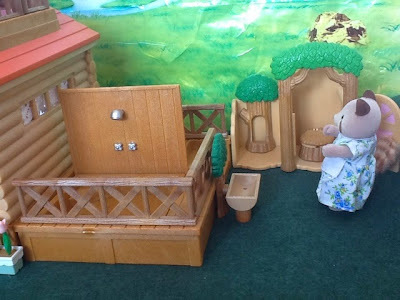 A shower was added to the bathing area as well as some toilets and a basin. No need to go deep into the forest to do one's private business anymore. While admiring all the new additions to their home, there was a knock on the cabin door. 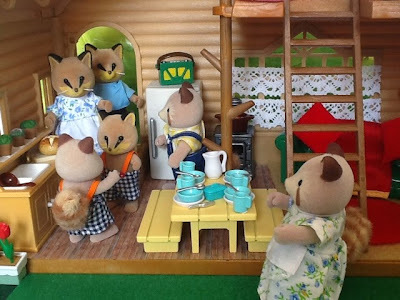 Mae hurried inside as it must be their friends, the Renards, who they have invited over for dinner. Mae and Roxy has been best friends since school, but they hardly get some time these days to have a chat. Elmar: Welcome Roxy, Eric and Baden. The Renards stepped inside, Baden and Ike felt awkward for a few seconds for wearing the same pants and gave each other the once over and the evil eye, after which they burst out laughing. Ike: Come on Badie, let me show you my baby sister's cool new room. While the boys climbed upstairs the men headed out, with a beer each. Elmar wanted to show off his handy work to Eric. Roxy: Wow Mae, your cabin looks stunning. I think you did a great job with making it comfortable for a family of five. 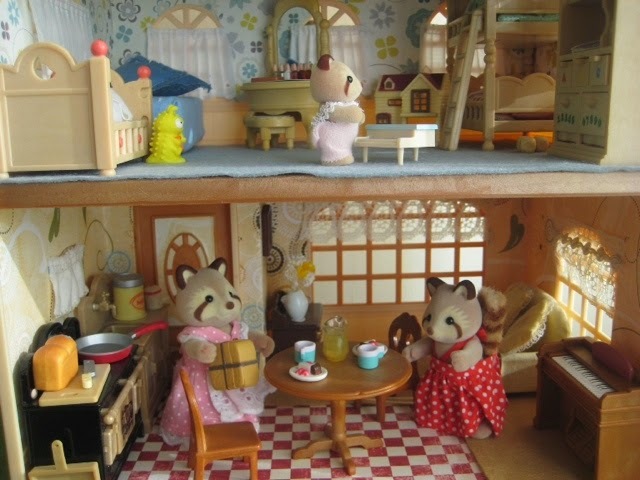 Mae: Yes it took some planning, but we are all settled in and are living together in harmony. Roxy: I especially love that bookcase. Mae: Thank you, yes that must be my favorite too. It was an anniversary gift from Elmar, desigend and made by Aaron. Roxy: Oh my, look at this! Is this what I think it is? Mae (laughing): I was wondering if you would recognise it. Yes, it is our old sleeper couch. We really debated the fact if we should rather substitute it with a daybed that can double as sofa, but then all the memories it hold, came flooding back and we decided to just refurbish it. I decided to go bold, and I'm very happy with the final product. Roxy: You should be, it looks fabulous and is most certainly the most modern looking piece of furniture in all of Sugarbush Valley. The friends burst out laughing. Roxy settled on the couch, while Mae had to finish dinner. Candy came down with little Pumpkin, to help her mother. Roxy adored Pumpkin and loved spending time with her, especially because Roxy had given up all hope on having another baby. Soon it was bedtime for little Pumpkin and Candy offerd to pu her sister to bed. Just as they were about to have dinner, there was another knock on the door. Elmar: Mae, are we expecting more company? Mae: Not that I'm aware of. Elmar opened the door and to everyone's surprise it was Pete Petite and his girlfriend, Margaret. Elmar: Pete, glad to see you, come in. Pete: Hi all, hope we are not intruding. Mae: Not at all, do come in. Pete: Actually we can't stay. Mayor Hugo is expecting us and I'm sure Savannah cooked up a storm, to welcome us with. Mae: I guess you are right, but what about a quick glass of wine then? Mae: Pete, don't be silly we have met Margaret the previous time she came to visit and I'm sure we all remember each other. Pete (blushing): Yes Mae, I know that, but what I wanted to say was ... introduce you to my wife, Mrs Margaret Petite. Roxy: What? Did you elope? Mae: Nooooo, tell me you didn't? Margaret: Sorry to disappoint you all, but we couldn't wait. We just know it was meant to be and saw no reason to delay the inevitable. Pete: Don't worry ladies, we will have a small celebration soon, we just first want to find our feet. Roxy: Of course and that is good to know. There were congratulations all round and everyone was truly happy and excited about the wonderful news. 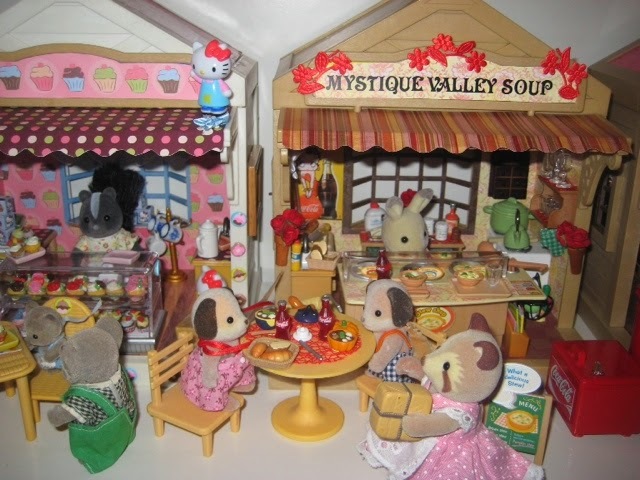 Pete: Mae the other reason we stopped buy is that I have a parcel here from your sister in Mystique Valley. Mae: Oh really, thank you. Pete (thinking back): It must be something really special as your sister came to deliver it personally at my brother's home. Pete: She insisted that I put it in my bag while she was watching, as she was afraid that I will forget to pack it later. Pete: She described in great lenght how she had to manuver the busy streets of the Village to deliver the package and that it will be a great dissapointment if I had to forget it. Mae had to laugh at Pete's description of her sister, it sounded exactly like her. Mae took the parcel and placed it on the bookcase to be opened later. 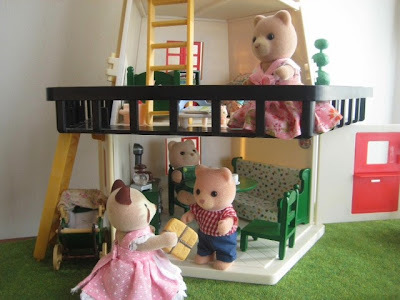 The Petites wished them all a good evening and left. 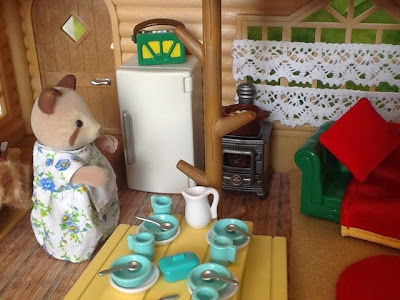 After a hearty dinner of freshly baked bread and Mae's famous stew, the men settled in the living area while Mae quickly did the dishes and Roxy prepared coffee. They continued to discuss the news they have just heard. Roxy: Poor Pete, I'm so glad he finally found his special person. Mae: Yes me too, it felt like yesterday he came to Sugarbush all alone and new. Roxy: Now he is just as part of the village as me and you, and I know Margaret will fit right in. Mae: Yes, she looks really nice. I wonder what she will do? Pete once mentioned she is a qualified beautician. Roxy: It will be wonderful if she opens a beauty salon, we all need some pampering. After they had several cups of coffee the Renards left. They thanked their friends for a wonderful evening and promised each other to do it soon again. Mae washed the cups and took the parcel from the shelf. She was really curious of what it could be. As Mae began to open the package she envisioned her sister in her kitchen in Mystique Valley. Instantly Mae became teary, she missed her sister so much. The parcel was filled with surprises. Inside was a soft toy for Pumpkin, whose birthday is due soon, some sweets for Ike and Candy. Then also for Elmar and Mae an anniversary gift, an antique clock. 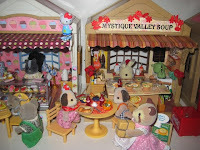 Mae immediately recognised it as the one they saw at a shop in Mystique Valley over a year ago when they visited there. Mae put the sweets in a bowl, the kids will have it when they wake up in the morning. The beautiful notecard she placed on her new fridge door. Then she went to the bookcase to put the clock in the empty space on the shelf, it was as if it belonged there. Mae couldn't wait to show Elmar, who went for a quick shower before bed. They both wanted the clock, but didn't have the money to buy it then. It was indeed a thoughtful gift from her sister. 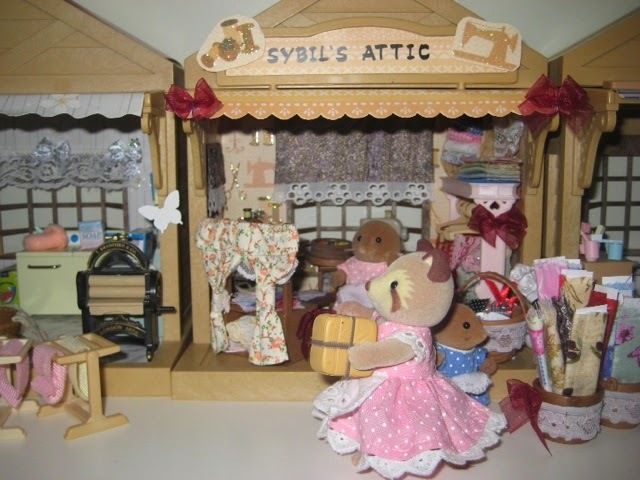 Thanks again to Sigrun for the beautiful photos of her vilage. I requested one and she send me 7, so I was forced to alter the story a bit to accomodate at least 5. 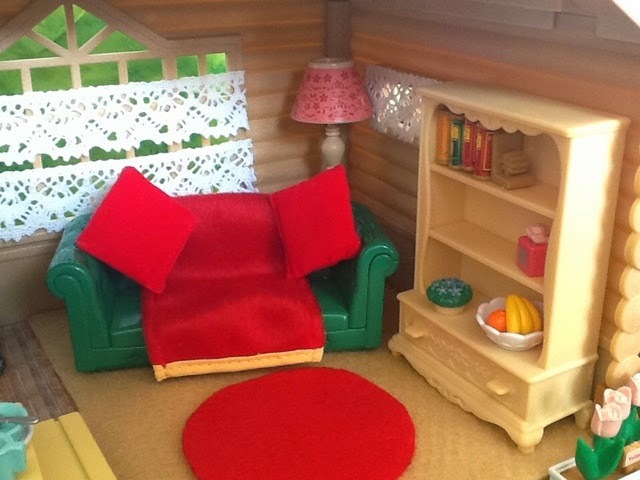 Most of the decorative items came with the cosy living room set, but thanks also to Candace for the miniature scrabble box she send me, that the kids were playing with. you've wrote again a wonderful story. I really like the bookcase too - it's so charming. And I loved that parcel - an adorable idea (She's got a very nice sister)! Thx for the nice comment, Jennifer. What a fun story!! Your decorated shops and houses are awesome. Thank you very much moonrabbit! I appreciate your comments!